Many Blaupunkt stereos use a coded Keycard to activate them, a bit like a credit card with a smartchip on it, or the later style (MMC) that resembles a memory card. However, if you have lost your Keycard, you will need both a new replacement Keycard (supplied blank) and also the unique Master Code number for your radio in order for you to reprogram it. Blank cards and Master codes can be found on our website for those that want to try this for themselves. We do get quite a few requests though, by those who are a little daunted at trying to reprogram a new card and would rather send the unit in to us for a complete turnaround decoding service that will include supplying and reprogramming a lost or missing Keycard. 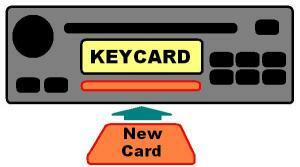 So, if you have lost or misplaced your Keycard, you can now send the unit to us to supply and reprogram a new card. You will need to send the unit to our workshop for this work to be carried out. Approx turnaround time is 48 Hours from receipt to dispatch. We will decode and reset the unit and can then return it back to you along with a brand new working Keycard. If you have received a link to this page as a result of an E-Mail that has been sent to you, or a recent phone conversation, then please follow the instructions below for what to do next. If you are programming a new blank MMC-Card for this radio, the Master Code required is available NOW using our fully automated INSTANT RADIO CODE service. Once your Radio details have been submitted, your Master Code will be ready - Instantly !! - No Waiting !! If you are programming a new blank Keycard for this radio, the Master Code required is available NOW using our fully automated INSTANT RADIO CODE service. Once your Radio details have been submitted, your Master Code will be ready - Instantly !! - No Waiting ! !